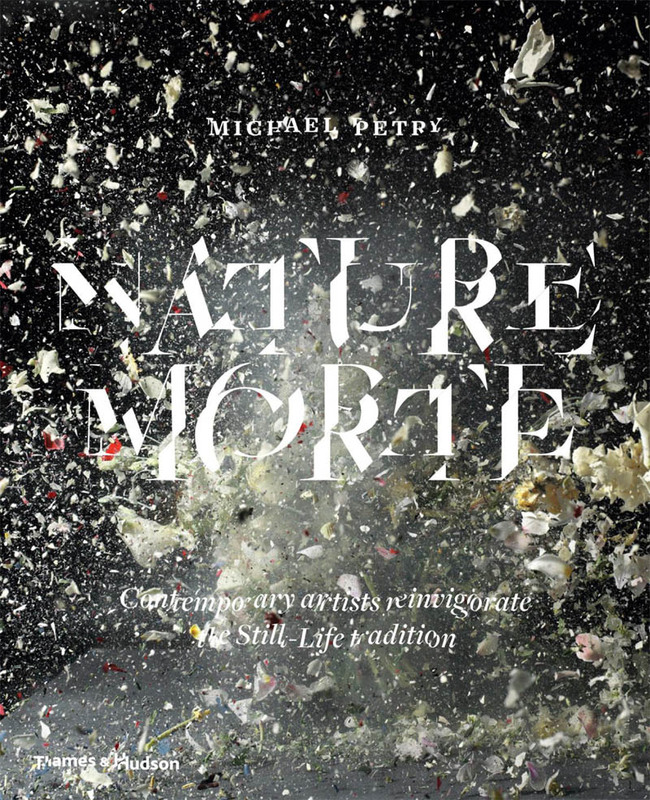 Works are included in Nature Morte: Contemporary artists reinvigorate the Still-Life tradition by Michael Petry, published globally by Thames & Hudson (English), Hirmer (German) and Ludion (Dutch). Among the artists represented are John Currin, Elmgreen & Dragset, Robert Gober, Renata Hegyi, Damien Hirst, David Hockney, Alexander James, Gary Hume, Sarah Lucas, Beatriz Milhazes, Gabriel Orozco, Elizabeth Peyton, Marc Quinn, Gerhard Richter, Sam Taylor-Wood and Ai Wei Wei. Alexander James’s ‘Grace’, from his Vanitas series, depicts a floral arrangement of tulips that recalls Dutch paintings from the seventeenth century. The difference is that his bouquet has been photographed underwater. Vase and stool sit inside a tank filled with water as light filters gently across the scene, illuminating the individual petals and creating an intense painterly effect. James has captured the contrast of dark and light typical of the Dutch tradition, while making an image that is strikingly contemporary. Alexander James and McDermott & McGough conjure in their photographs an idealized time past that overtly situates these works in the painterly tradition of the still life. 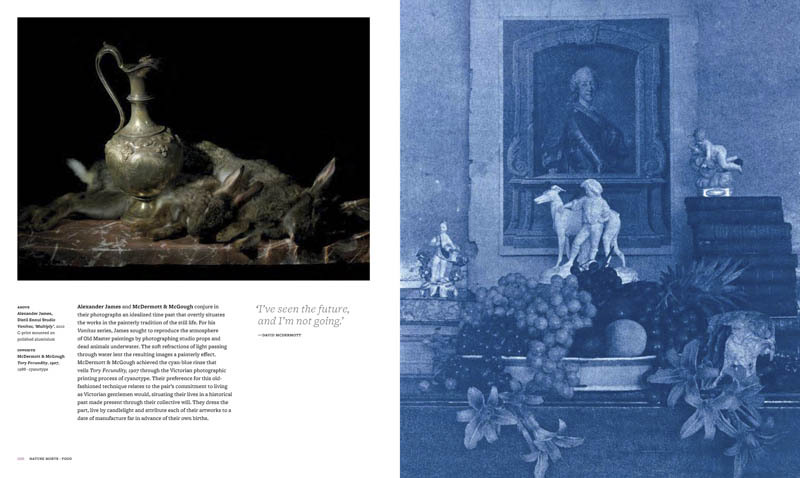 For his Vanitas series, James sought to reproduce the atmosphere of the old master paintings by photographing studio props and dead animals underwater. The soft refractions of light passing through water lent the paintings a painted effect. 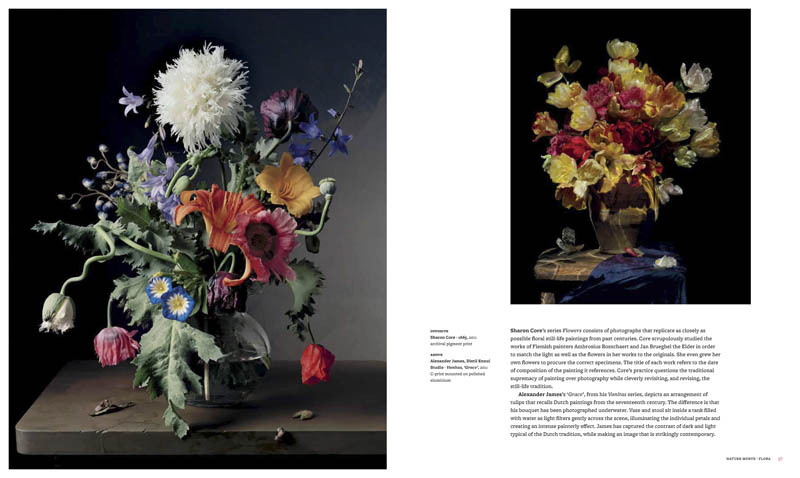 Alexander James and Shirana Shahbazi have both constructed photographs that recall Dutch still lifes of the seventeenth century, but their methods differ. The flowers, skull and butterfly in James’s Vanitas, ‘The Great Leveler’ were shot underwater; submerged in a large tank, they rest on a marble shelf and shimmer in their watery tomb. Shahbazi’s Stilleben-33-2009 presents a similar group of objects but the crispness of her photograph is at odds with James’s mottled tones. One may feel like a stark warning of mortality, the other a half-remembered image from a dream, yet both successfully move the imagery of the still life forward.